Like art and volcanoes, fashion can be explosive, fiery, and intense. 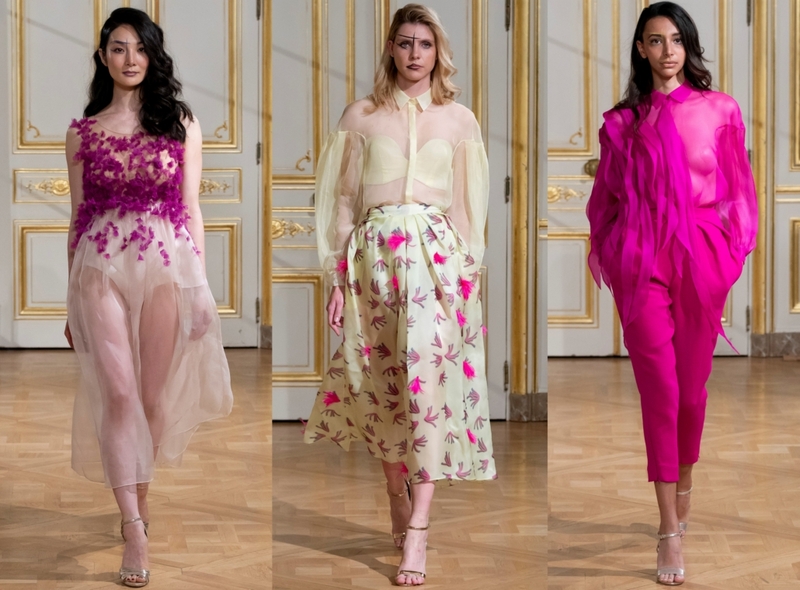 The same can be said about Lebanese Designer Rani Zakhem Spring Summer 2018 Collection at Paris Haute Couture Fashion Week. 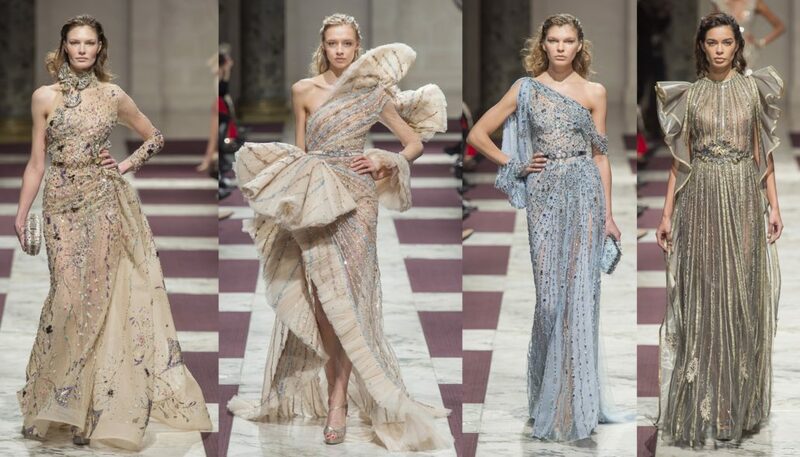 Like an erupting volcano, his phenomenal haute couture collection was filled with fury, fervor, and effervescence! 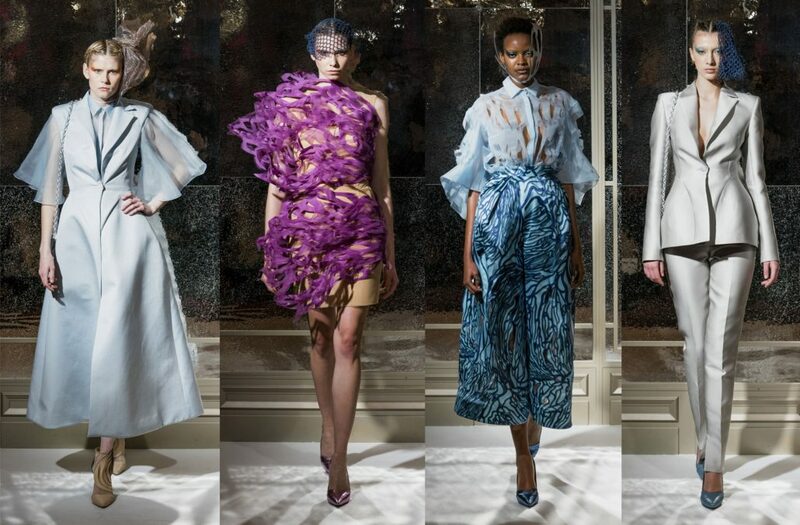 For his first Paris haute couture fashion show, Rani Zakhem celebrates life and joy in incandescent metaphors. Fire is the essential element of this sumptuous yet relaxed collection, dedicated to a volcanic woman. 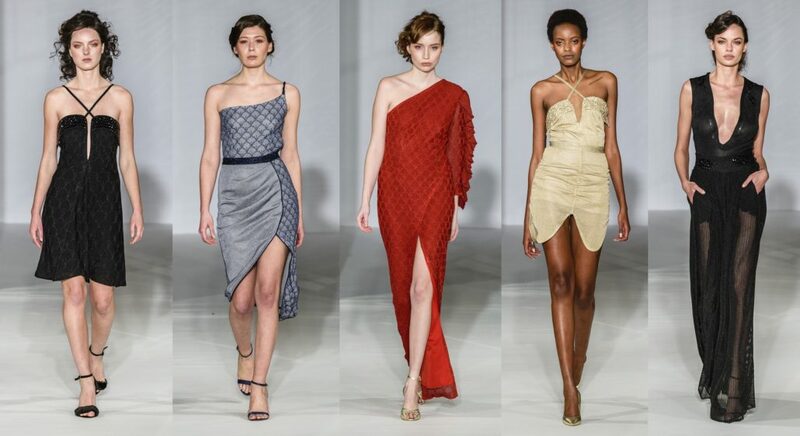 Get to know the beautiful women’s fashion collection below. As devouring as ethereal, the sacred element comes in pyrotechnic explosions and cascades of gold, drawn by embroideries of arachnoid crystals of lava on the black of a sheath whose draped top splits into a deep “V” neckline. 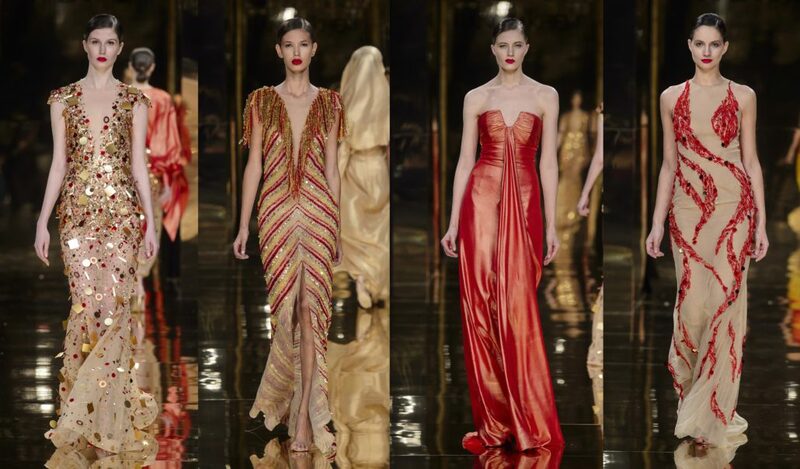 Some creations seem to be sculpted in the light, like the pearl-beige silk dress, where red, orange and gold gems glow with a myriad of sequins that bring precious reflections back to the surface. The image of an erupting volcano is spun to the neck, columned and entirely gilded, a recurring element of the collection and keystone of an architecture that favors ease, movement and, the dancing flames that seem to devour the fabric barely touch the floor. Reminiscent of a party in Vienna where the designer returned bedazzled, Klimt’s Kiss, itself cast in gold in a powder dust of stars, infuses into the collection a resolutely modernist visual vocabulary, translated into sequins of geometric forms. 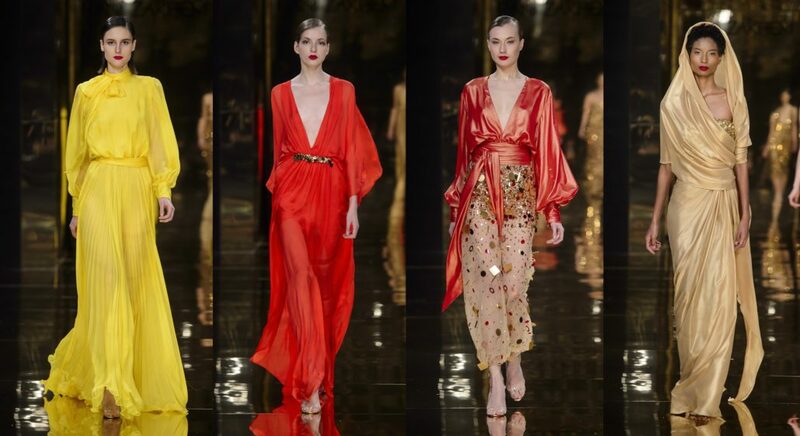 Geometry that also brings us into the disco spirit of the 1970s with many references to Halston, especially in a loose single shouldered fluid dress with a golden Mao collar, in a fanned out degradé rainbow, gold to red through yellow and bright orange. Gold, again, subtle and powdery, sculpts a feuille d’or chiffon dress, knotted in a wrap around bustier dropping into a deep backline, a tribute to Mireille Darc elegantly quoting Guy Laroche. Clearly, the theme of fire sometimes extinguished leaving precious streaks of diamonds on silky nights; sometimes fluid, sizzling cascades of molten metal on a short dress with a dripping panel, and sometimes gently iridescent with warm colors is only a pretext chosen by Rani Zakhem to salute the masters who nourished his vocation. A scarfed collared, vertiginously split yellow chiffon, plissé Soleil dress with mouton sleeves, is a joyful smile addressed to Jean-Louis Scherrer. 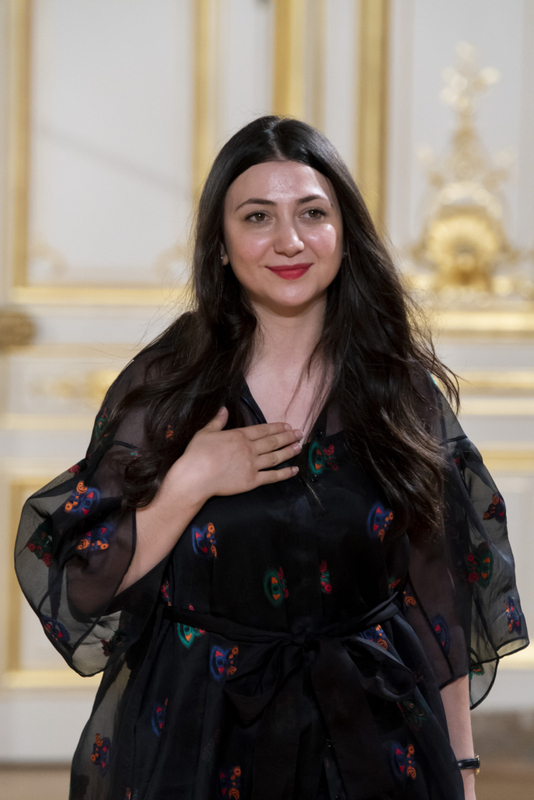 Another, short black silk satin, real Moujik tunic adorned at the bottom with pleated yellow faille embellished with a large bow of the same fabric is a nod to Yves Saint Laurent. 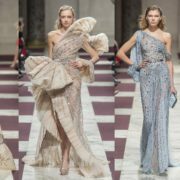 A third composed of a densely embroidered golden top with narrow three-quarter sleeves and a long black pleated skirt is a reverence to Balmain. The heart skips a beat when the liquid gold drape of a silk jersey habillé evening sheath appears, ending with a large bow of black silk satin on the shoulder, a tribute of the designer to Madame Grès. 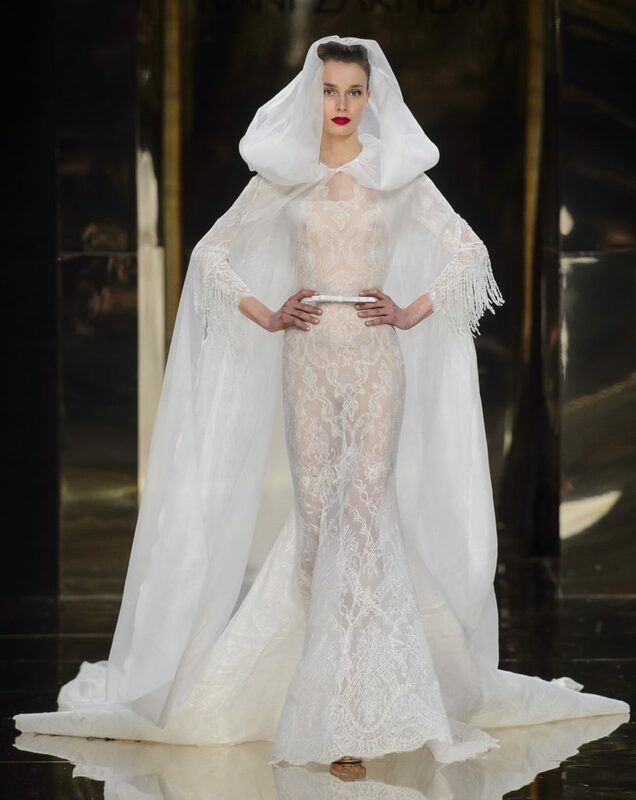 A delicate apotheosis of this fashion show, shaped in flowing lava and blazing fires, is the wedding dress, long and tight, in delicate whitish lace, emphasizes by its precious simplicity the minimalist bias of a collection with budding emotions. 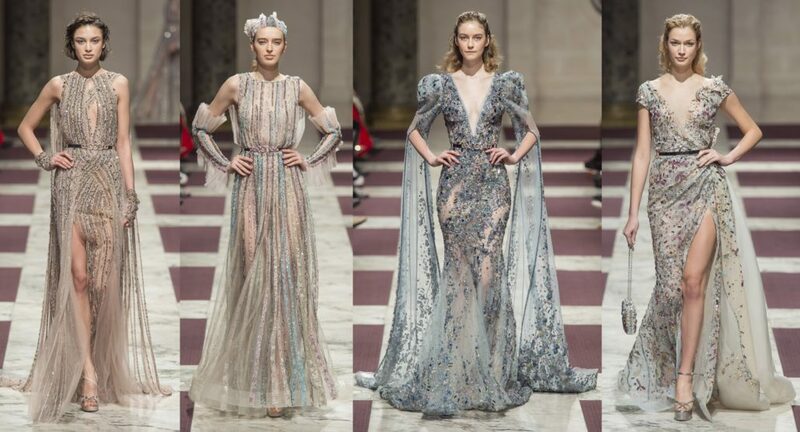 What are your thoughts on Rani Zakhem‘s Paris Haute Couture collection? 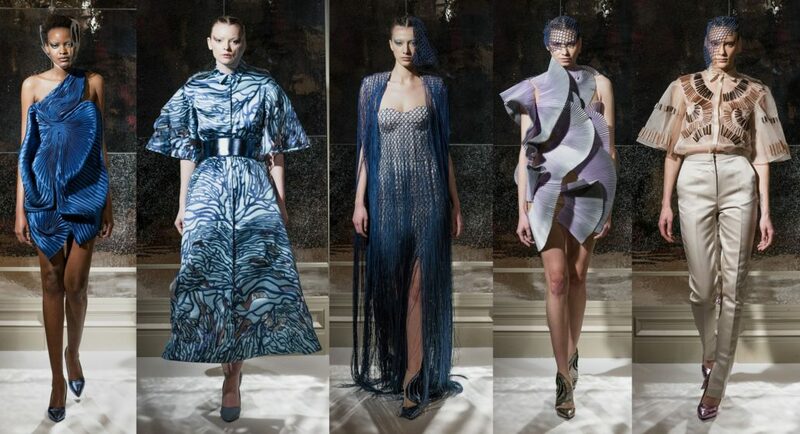 Maison Martin Margiela presented a powerful Haute Couture collection today, their 2015 “Artisanal” Collection. 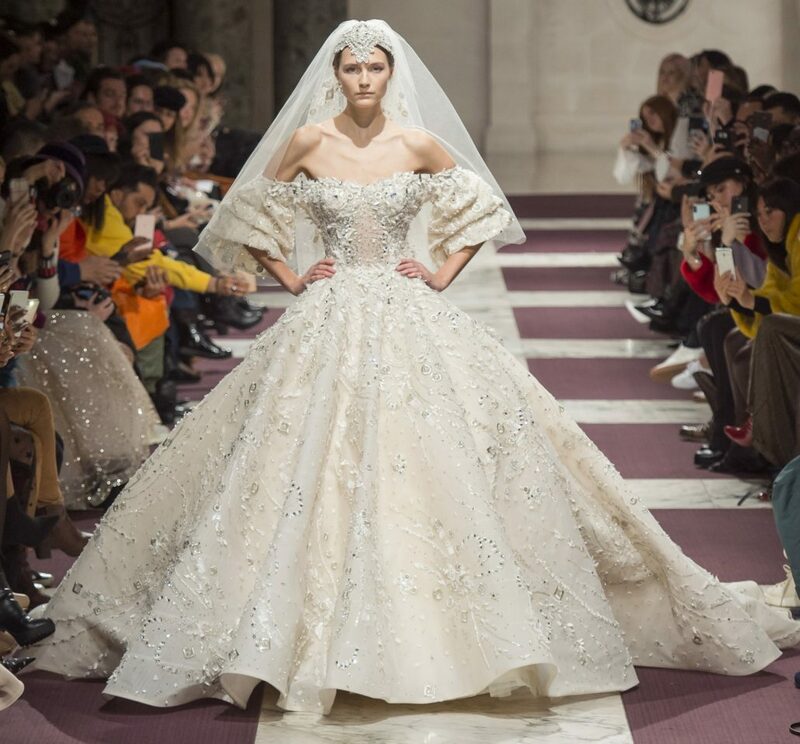 The iconic and avant-garde French fashion house’s extraordinary second Artisanal collection is a visual shot of adrenaline, boasting a forceful yet refined mix of fabrics and materials, many of which were stripped down, or juxtaposed in startling and unexpected ways. 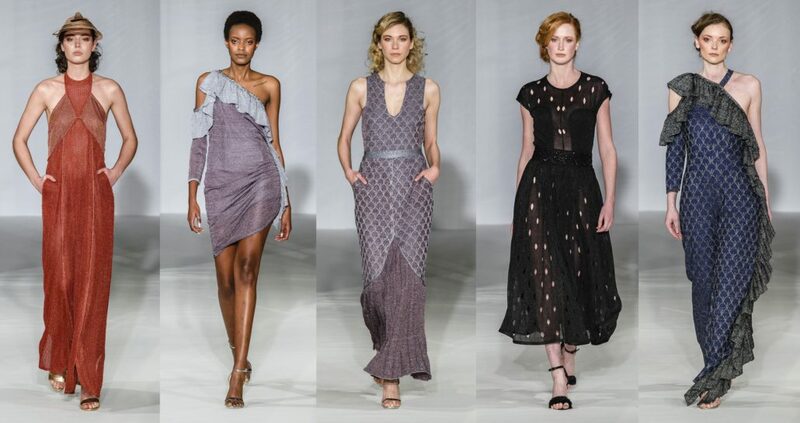 The stunning and masterful collection takes on a new direction with shapes, which played on proportions and sartorial rules. 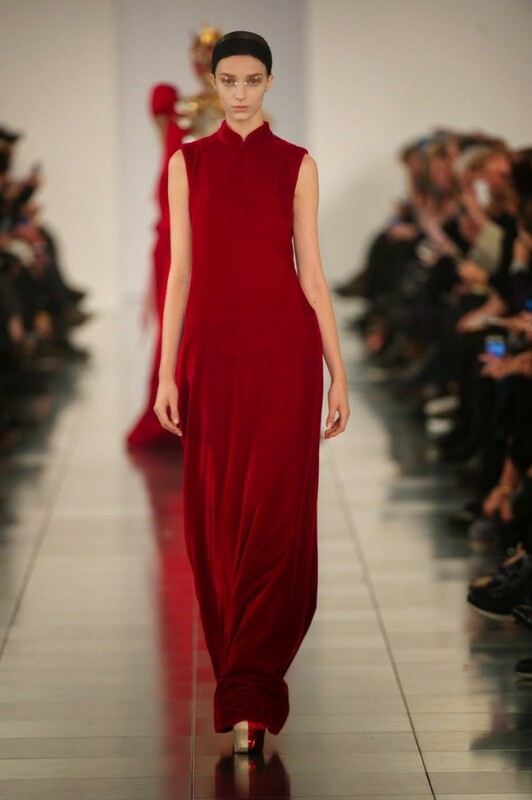 It featured a new fuller, revealing silhouette, with precise tailoring. The collection’s goal is to open one’s eyes to see beauty in things that are often taken for granted, giving each piece a newly enriched life. Described as “Eyes wide open in wonderment to a veritable Cabinet de Curiosités“, there are several standout details and embellishments, including “a jigsaw of lacquered shells reminiscent of Arcimboldo style figures, a miniature battalion charging across a black velvet shoulder and Pearls that bring teardrops of memories to the face;” piece by piece, deconstructing and constructing a new story for Maison Martin Margiela. 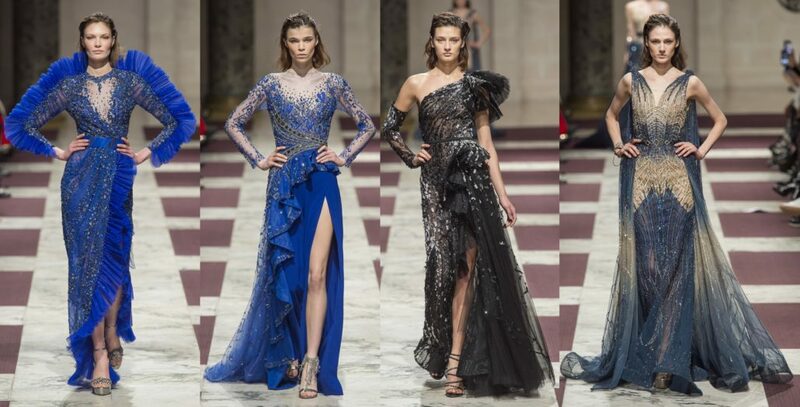 You can’t help but be wowed by the absolutely beauty and edginess of this collection. It truly shows why people fall in and stay in love with Margiela year after year. The illustrious show also featured striking makeup by the ever-so-fabulous Pat McGrath and featured slicked back hair by Eugene Souleiman.